Pavel Srníček (10 March 1968 – 29 December 2015) was a Czech professional footballer who played as a goalkeeper from 1990 to 2007, mainly for Newcastle United. In addition, he represented Sheffield Wednesday, Portsmouth and West Ham United in England, and also played in Italy for Brescia and Cosenza, in Portugal for Beira-Mar, and in his native country for Banik Ostrava. After retiring, he worked as a goalkeeping coach for his own private school and for Sparta Prague. A good read for football fans, not sure of the wider appeal. This appears to be an honest autobiography with a lot of comments that tend to get sanitised by lawyers nowadays. There is certainly no holding back when describing some of the controversial issues. A wonderful book about a proper people's hero. I was fortunate enough to meet Pav a few times back in the day. What a lovely human being a real gentleman. Mind you he did have hands like JCB shovels! Marvellous insight of the world of football. Fantastic read! Hope it wins! Deserves every vote. Amazing book. Currently reading as we speak. From a Jock who's a toon fan . Loved Pav. A legend and icon of the rise of a city through football perfectly captured. Awesome book - well-written tribute to a real hero. A brilliant tribute to a true gent! The story of a once unknown man who went to become an adoption son of the Geordie nation - brilliant read. 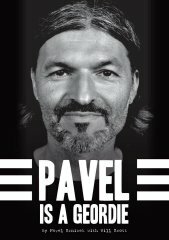 Pav was one of the most loved players ever to pull on the jersey, and I really enjoyed reading about his life off the pitch, especially his early years growing up in the Czech Republic. Patel was and always will be a Geordie. A lovely person who deserves some recognition. Wonderful guy and an he was inspiration to all. A really good read giving an open and honest insight into one of Newcastle's most popular players in recent times. Pavel is a Gerodie !! A wonderful story of a man who arrived in this country with, virtually, nothing, but worked hard to become a great goalkeeper and warmed the hearts of every Geordie with his attitude, kindness and personality. Pavel Srnicek was an absolute gentleman and superb role model for all youngsters aspiring to be a professional footballer. Excellent book about a true professional, who earned respect both from his peers and his fans, for his honesty and his commitment to 'always doing his best', whatever the circumstances. Well-written book by both authors. Totally deserves to win. Brilliant book, fully deserves the award! Have bought and loved Pav,s story,so honest!